The meteoric rise of ailments like cancer, chronic renal diseases, and obesity are creating a massive opportunity for companies operating in the global huber needles market, in addition, government regulations to ensure patient safety and to minimize needle stick injuries are expected to drive the growth of the global huber needles market during the forecast period as according to WHO reports in the World Health Report 2002, that of the 35 million health-care workers, 2 million experience percutaneous exposure to infectious diseases each year. It further notes that 37.6% of Hepatitis B, 39% of Hepatitis C and 4.4% of HIV/AIDS in Health-Care Workers around the world are due to needlestick injuries. Major huber needle companies like Baxter International Inc., C. R. Bard, NIPRO Medical Corporation, B. Braun Medical Inc., Smiths Medical, Exel International, Inc., Vygon S.A., AngioDynamics, Inc., and Thiebaud S.A.S are adopting distribution agreement as a key strategy to expand their global presence. Goldstein Research analyst forecast the huber needles market size is set to reach USD 50 million by 2024, at a CAGR of 7.1% over the forecast years. Increasing purchasing power among people and rising government initiatives for the use of safety needles are expected to drive the growth of the global huber needles market. The report covers the present ground scenario and the future growth prospects of the huber needles market for 2016-2024 along with the data of production and shipments of Huber Needles market worldwide. We calculated the market size and revenue share on the basis of revenue generated from major players across the globe. The Huber Needles Market is forecasted on the basis of revenue analysis, product benchmarking and strategic developments of key market players. Based on application, intravenous cancer application of huber needle dominated the market with the market share of over 30% in 2016 while blood transfusions application segment is expected to be one of the fastest growing segments in the global huber needles market with a CAGR of 7.5% during the forecast period. On the basis of product type, curved huber needles are the dominant segment owing to the wide usage in drug infusion, blood transfusion, and dialysis. Global Huber Needles Market Outlook 2016-2024, has been prepared based on an in-depth market analysis from industry experts. 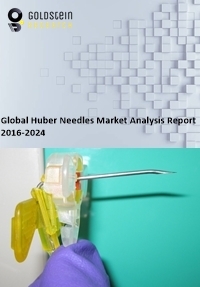 The report covers the competitive landscape and current position of major players in the global Huber Needles Market. The report also includes porter’s five force model, SWOT analysis, company profiling, business strategies of market players and their business models. Global Huber Needles Market report also recognizes value chain analysis to understand the cost differentiation to provide competitive advantage to the existing and new entry players. Our global Huber Needles Market report comprises of the following companies as the key players: B. Braun Medical, Smith Medical, Baxter International, NIPRO Medical Corporations, C.R. Bard, Thiebaud, AngioDynamics, Exel International, Vygon S.A., Medsurg, Novo Nordsik, Medtronic, Hamilton Syringes & Needles, Terumo Corporation, Nipro Medical, BD Medical, Boston Scientific and Hi-Tech Medicare Devices. According to the report, major driving factor is the increasing intensity of the diseases like cancer, chronic renal diseases and obesity across the globe. These huber needles are used in chemotherapy, drug delivery, transfusion and blood sampling where patients need repetitive vascular access and fluid therapy for long term. Further, the report states the biggest challenge is the small gauge of the needle which causes the blood cell to be damaged and platelets clumping and leading to the risk of hemolysis. Collecting sample in large quantity is difficult by this method as well. Based on geography, North America accounted for the largest market share i.e. 32% in 2016 followed by Europe owing to increasing number of patient base and rising prevalence of chronic diseases. APAC is the fastest growing market and tends to grow at a CAGR of 8% over the forecast years owing to significant increase in healthcare services spending along with rapid economic growth and increasing awareness about health issues. Large economies like China, Japan, Germany, India, UK, Russia, Canada are the opportunistic market due to the increasing prevalence of chronic issues and evolving healthcare infrastructure in terms of reimbursement policies and medical insurance coverage awareness. What is the revenue of total market in 2015-16 and what would be the expected demand over the forecast period?